Today in the semi-finals we had Karnataka who were playing in orange and yellow while Bengal were sporting all white t. Karnataka started with the kick-off and an early attack from Karnataka’s U-21 midfielder Leon Augustine who threatened the Bengal side. Karnataka were holding onto ball possession in the initial minutes of the game and their long balls were safely reaching into in the hands of the Bengal goalkeeper . Karnataka attacked from left to right while West Bengal attacked from right to left. Karnataka with an attack from the left and in the fourth minute and a cut back lead to a pass with a shot from edge of the box. The ball took a deflection and went out for a corner.Karnataka with yet another chance let the ball go across the face of the goal without causing any harm.Karnataka with another free kick in the sixth minute as captain Vignesh Gunashekar took an outstep which was chipped away by the Bengal side. Bengal won another free-kick for themselves and Tirthankar Sarkar with a cross into the box but was cleared by the Karnataka defence. Monotosh Chakladar took a right foot drive but the ball went wide of the target. Leon Augustine continued with another attack as he tried a shot inside but was blocked by Sourav Dasgupta.Karnataka again with an attacking move and a cross into the box and finally cleared by the Bengal defence. Karnataka continued with a number of passes leading to their build-up with a long pass that went straight to the Bengal goalkeeper.Bengal with Tirthankar Sarkar assisting to U-21 midfielder Bidyashagar Singh but a poor cross let them down.A corner for Karnataka in the nineteenth minute was blocked leading to a counter by captain Jiten Murmu followed by an excellent run by midfielder Sumit Das yet the pass could not convert into a goal. Karnataka now on the attack again with Leon Augstine’s cross into the box and was headed for corner by a bengal defender.Karnataka tried to penetrate the Bengal defence but failed this time and a throw-in for Bengal. Tirthankar Sarkar had a wonderful forward ball to Bidyashagar Singh in twenty fifth minute and his cross results in hand-ball and a free-kick for Bengal at the edge of the box.Tirthankar Sarkar with the free-kick and he almost scored with his left foot . Dangerous ball into the box from the right by forward Rajesh S but safely cleared by the Bengal defence. Cooling break for both the teams in the thirtieth minute. Teams were back on the field and were all set to resume proceedings with a throw-in for Bengal. Bengal with a pass from the left flank but went straight to the goalkeeper.Midfielder Sumit Das with some wonderful skills in the opponent’s box and almost created a goal scoring chance but Karnataka’s defence was alert and cleared the ball out of danger.Bengal shoots from distance but in vain with some better intent after the break but failing to make any in roads.Free-kick for Karnataka in the thirty eight minute because of high boot by Ankit Mukherjee of Bengal. Corner from Rajesh with no success. Bengal goalie Ranajit Majumder lured medical attention. Karnataka with a throw-in and a run down the right by Karnataka but was blocked by defender Sourav Dasgupta.Karnataka again dominating the ball possession and a move to find an opening in the Bengal defence. A cross by forward Rajesh S but the ball goes out for a goal-kick. Karnataka again with a chance but defender Monotosh Chakladar cleared the ball for a corner kick. Four minutes of added time at the end of the first half.Bengal trying to build up an attack and a fine pass by Tirthankar Sarkar into the box but a timely header by the Karnataka defence saved the team from danger in the third minute of extra time. Match restarted with no.13 defender Krishna Biswas replaced for midfielder Sanchayan Sammadar. Tirthankar Sarkar was almost through with an outstanding run as he collided with the goalkeeper of Karnataka not being able to check his run.Bengal with another goal scoring chance as Bidyashagar Singh got a chance to shoot but the shot went way off target in the eighty fourth minute.Karnataka continued their attack as the midfield seemed to break apart yet the defenders were quick to action each time.Five minutes of extra time were added.The final substitution for Bengal as Sujay Dutta came in for Sumit Das. Captain Jiten Murmu wins a free-kick right at the edge of the box as he is brought down from the back in the first minute of extra time. 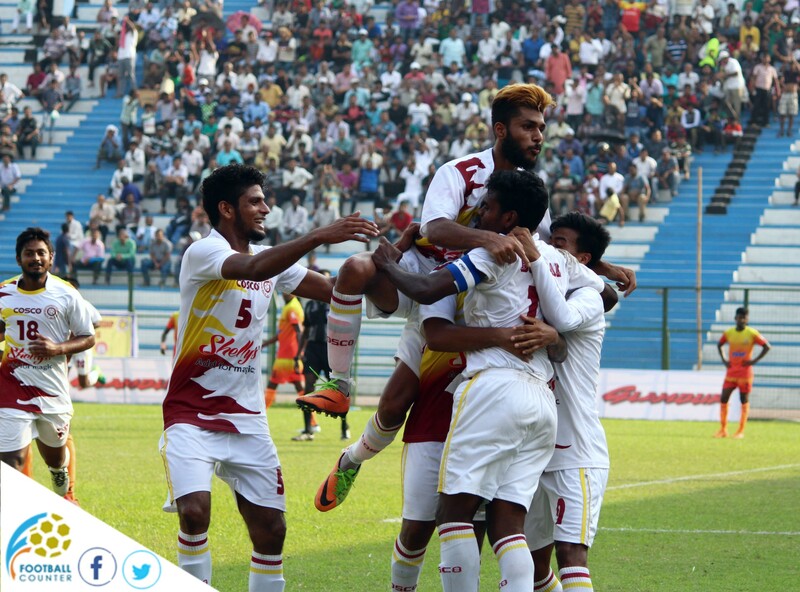 Tirthankar Sarakar with an amazing free-kick to doubled the lead for Bengal and sealed the deal.West Bengal have made it to the Finals of the 72nd edition of Santosh Trophy.